Chelsie Raabe of Wauseon serves one during a Division II volleyball district semifinal at Bluffton University Tuesday. The Indians swept Lima Shawnee 25-16, 25-22, 25-21 to advance to the district final. Skylar Reckner of Wauseon with a bump Tuesday versus Lima Shawnee in the district semifinal. 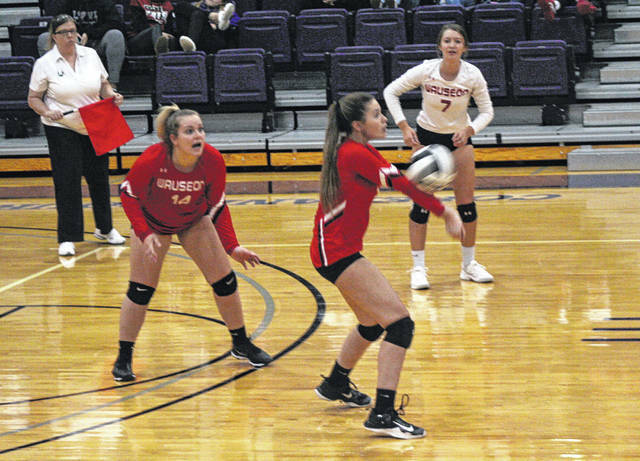 BLUFFTON – Top seed Wauseon left nothing to chance, sweeping third-seeded Lima Shawnee 25-16, 25-22, 25-21 Tuesday in a Division II volleyball district semifinal at the Sommer Center on the campus of Bluffton University. The Indians were well prepared going into the match. It didn’t hurt being able to host the sectional tournament where they got an early look at Shawnee in their match against Celina. Wauseon was able to break it open in the middle of game one, like they have done many times this season. After a pair of Karrington Green kills that pulled Shawnee within 10-8, Wauseon ripped off five in a row. A Shawnee serving error started it, Harlee Floss fired an ace for Wauseon, Maddie Trejo dumped one for a point, then a Shawnee hitting error and Chelsie Raabe’s shot from the middle put Wauseon ahead 15-8. Shawnee had to use multiple timeouts in the game, but it didn’t help as Wauseon pulled out the nine-point win. A total of four Lexi Sauber kills and also four errors by Shawnee helped Wauseon get out to an 11-5 lead in game two. Trailing by as many as 10, Shawnee attempted to come back and steal the set. They went on a 6-0 run to get within two, 24-22. Amber Greenley fired one down the middle, Kelly Armentrout scored three times from the left side, Wauseon had a hitting error and Kelsey Fischbach also scored for Shawnee. However, Sauber closed it out with a no-doubter down the middle. A Sauber kill, plus three straight points from Raabe helped Wauseon create separation, 11-5, in what turned out to be the third and final set. One of Raabe’s points came by way of a block. But, the third set was mostly close. Shawnee even took leads at 15-14 and 16-15. 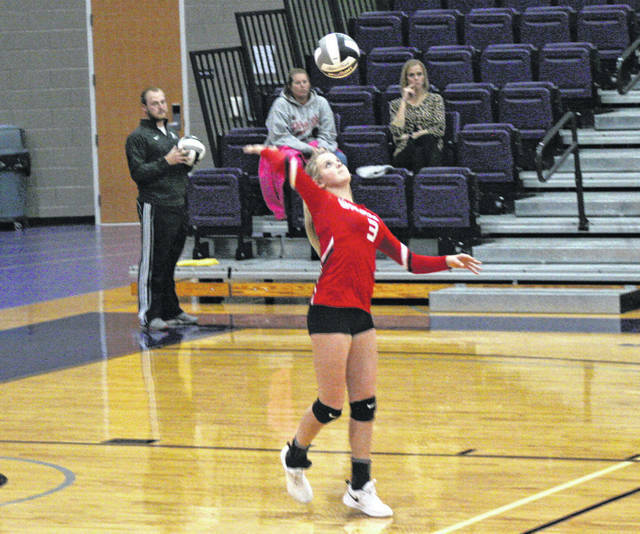 The match was tied at 18 when Wauseon got two kills from Sauber, Shawnee committed an error, Tamera Smith’s shot down the middle and a Sydney Zirkle ace enabled them to pull away. Sauber paced the Indians with 19 kills, seven blocks and eight digs. Raabe chipped in with nine kills, five blocks and two aces. Zirkle had nine kills as well. Wauseon (19-5) now advances to the district final where they will take on second-seeded Defiance tonight at 6 p.m.